A polyp was found during TV personality Dr. Mehmet Oz’s routine colonoscopy. The precancerous polyp was successfully removed by Dr. Jon LaPook, gastroenterologist and and Chief Medixal Correspondent for CBS News. 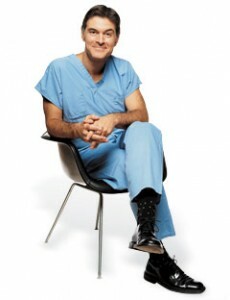 Dr. Mehmet Oz is fifty years old. The Emmy-winning surgeon and author joined the ranks of Early Show host Harry Smith and Today Show host Katie Couric, having a colonoscopy procedure done on-air for this season’s first episode of The Dr. Oz Show. He’ll discuss his feelings and fears during September 7th’s episode. The CCAC wishes Dr. Oz well, and hopes that this will influence an abundance of North Americans to take the steps to getting screened! Print article This entry was posted by KaitWallace on 3 September 2010 at 11:45, and is filed under News. Follow any responses to this post through RSS 2.0. You can skip to the end and leave a response. Pinging is currently not allowed. This comic (from the series In the Sticks by Nathan Cooper) made us chuckle. Click here to read more of this work- especially if you’re a golf fan! The GetYourButtSeen campaign has taken Halifax by siege, appearing on forty of the city’s Metro Transit buses! No ifs, ands or butts- this is a campaign (and a cause) that can’t be ignored. Fast-forward to 12:05 to see the story. Click here to read the official press release. Is enough being done to encourage screening equally across all ethnicities and cultures in North America?